Hours after Ferguson Police Chief Tom Jackson announced his resignation, two police officers were shot outside police headquarters in Ferguson, Missouri, during a protest. The two officers were not members of the Ferguson Police Department, but came from other nearby forces, St. Louis County Police Chief Jon Belmar told reporters early Thursday morning. The protest reportedly broke out in the small, unsettled St. Louis suburb Wednesday night in the wake of Jackson's anticipated departure and simmering anger over the scathing federal report on the systemic racism within the city's police force. 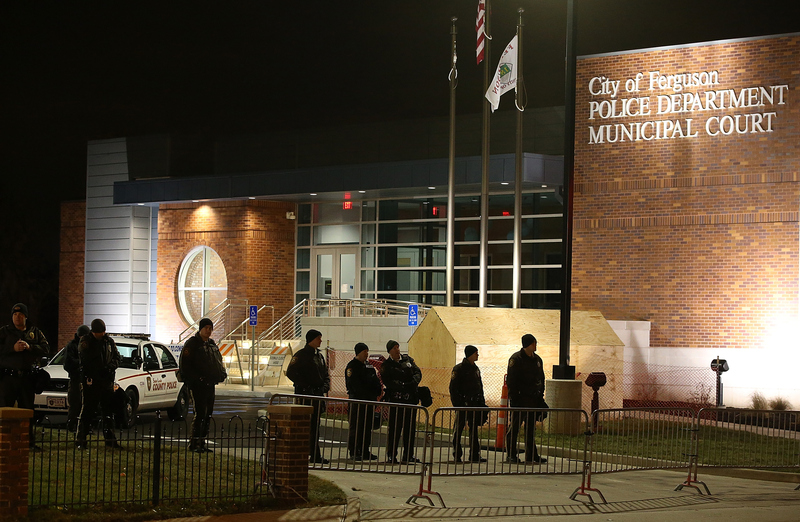 According to St. Louis County Police, the shooting occurred just after midnight on Thursday, as protesters lingered in front of the Ferguson police building. At least three gunshots were fired. The St. Louis County Police Department confirmed that one of the wounded officers is a 14-year veteran of its force. The other wounded officer is a 7-year veteran serving in Webster Groves, an affluent suburb located southwest of St. Louis. The two officers have yet to be identified. In a Facebook post released Thursday morning, St. Louis police said both officers remained in serious condition. However, the injuries they sustained were non-life threatening, the department said. Police believe these two officers were targeted, perhaps stemming from the resentment of Ferguson residents, who have endured civil unrest in their small city for seven months after the death of African-American teenager Michael Brown. "These police officers were standing there and they were shot, just because they were police officers," Belmar said at a news conference on Thursday. "I have said all along, that we cannot sustain this forever without problems." It's still unclear how the protest escalated into a shooting. Belmar told reporters that the demonstration was rather "uneventful" and "unremarkable," with just 60 to 70 people attending. The police chief added that some police officers even left before the shooting occurred. However, Reuters reports that protesters clashed with officers earlier in the night, causing police to break out their riot gear. At least two people were detained. A Reuters photographer said protesters fled when the gunshots were fired. Some yelled, "They hit a cop!" There's also conflicting reports over the location of the shooter, who has not been arrested. Belmar told the media that the shooter was allegedly "embedded" with the protesters, but those on the scene disagree. Activist DeRay McKesson, who was at the protest until early Thursday morning, tweeted that the gunshots did not come from the crowd. "The shot came from at least 500 feet away from the officers," McKesson tweeted. Jackson was the latest high-ranking Ferguson city official to resign following the release of the Justice Department report, which outlined instances of long-time racism and harassment within the police department. The DOJ concluded that the Ferguson Police Department had a history of discrimination against black Ferguson residents, who made up nearly 100 percent of the department's arrests and violations. The Justice Department's civil rights investigation was opened shortly after Brown's death by white Ferguson police officer Darren Wilson in August 2014. The department also probed Brown's death, concluding that there was not enough evidence to bring charges against Wilson. The police officer, who has since left the force, was also cleared by a St. Louis grand jury in November 2014.